Keep your massage table warm and inviting for your clients with an electric table warmer. In turn, give these clients an extra reason to keep coming back to you! We have 3 electric massage table warmers to choose from: The Table Warmer, the Electric Fleece Table Warmer and the Samadhi Pro. Don't want the extra chords? 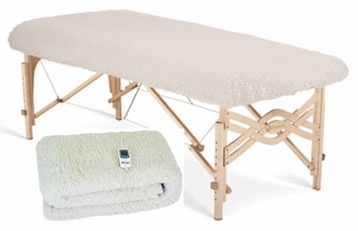 Fleece gives your massage table warmth while adding extra fluffy inches of pure comfort!